He said that he came to QL (in '96 in full promotion of V12 and in preparation of Wake Up Album that Koffi made with Papa Wemba) after being in a small group of Young Guys with no leader, thanks to his late vieux Maître 150 he had the opportunity to make the test straight to Koffi house with Mbochi and Koffi took him but he felt like he had much to accomplish and to learn since Koffi didn't scream or got crazy over his voice like leaders do when they are impressed with someone, (and like Koffi did with Mbochi) he didn't like what Jordan Kusa said about Koffi's dancers in his era (that they are Koffi's animals) since now they are married and with kids and in our culture is disrespectful calling someone's mom or a woman in general an animal, he didn't feel like Olympia was a big deal like everybody had becauss he was about 20 y.o. so to him was another concert while QL members with kids and family in Eurooe felt that it was the tine wherethey would have huge chunk of money ?. He doesn't speak a lot throughout the Congolese Diaspora Journalist because he simply didn't have much to say. Mamale brought good dancing skills a good singing voice and an impeccable image in QL but he can't say more because it is the people who judge musician, QL is a movemebt for the ladies and being there automatically gives you new fan and plenty of ladies to choose if you want to have fun, if you could bring 5,6,7 ladies to Rambo (as QL mbers like to call him) you would be forever in his grace. They were paid and Mamale didn't even think about money in the first place and in QL before having mojey you have to show your ability in fact when Mamale got accepted to the geoup Koffi called him and order to him to go in his office and told him to sign a paper and give him 100 dollars as his monthly salary (wow that's very low) and even outside of DRC in everywhere in Afruca you woyld get 100 dollars and for him as a youngguy of 20/21 was great to him, ans after the South African tour musician have started to make huge projects with the money they were expecting from Koffi so he go to Koffi house and funds Do Akongo and Depitsho Savanet and with Koffi they see Madilu System, so they waitand leave the room they were in to let Koffi and Madilu soeak, even though they weren' on the same room they have heard some glimpse of the conversation Koffi and Madilu was having and basically Koffi said: Now wait, Imma pay my petit musicians" and Madilu said: "What? What are you doing? Soyou pay these kids, you pay these musicians?" Koffi answerd "Of course, why don't you pay your musicians?" and Madilu fired back saying "Well, this month don't pay them so we see if the next month they will be your musicias again". All the project of most musicians felt and they haven't left also since Bercy was coming close, but beside that the salary was there in QL and beside that Koffi was a guy that he eas giving you trousers, shoes, and clothes in general and he was doing many many times and gave him even a car aftet they came back in Olympia and knew that his original car was broken, and as usual some witchcraft happened where almost every me mmm ber of QL was having serious accidents and he was one of the few left who was still unharmed and he adds thatof course witchcraft is there but no one will say hey look I go to the witchcrafters to have power it is a secret within each of th if they did it or not and I personally think that Mamale didn't do it. They have cancelled a trip because Koffi said that there is toouch witchery one time, musicians, lovers, sons, daughter, dancers all of them had massive witchcraft so Koffi feared his life and cancelled the trip, and adds that it is clearly visible when someone does witchcraft or not since they are specific rules to each occasion, for example in that occasion he knew that a guy didn't have shower always wear black and so on, and he knows whp these guys are but won't reveal it, Koffi just book the flight for the next day and the flight went well. A lot of talent was wasted over foolish pride; Mamale should have swallowed his pride leave the player's game to Koffi. These women you meet along the way are never your girlfriend, it's simply just your turn with them. Wasn't he married with children? Why would he let something petty like that remove him from the band? Where did he go after Koffi? My lingala isn't good. Manzambi your title is misleading I just watched the interview he didn't say anything bad about koffi, he even spoke about his koffi would be generous by gifting them clothes and cars and so on. He is talking about him in a respectful way but you can hear and see that he didn't like the way he was treated especially when saying that "I was a young kid, after Olympia concert I wasn'y expdcting the huge money Suzuki and.other guys were thinking" or "I had to earn QL respect before making vocals or songs" typically not very good things to aay about your boss especially the money part. Knowing Fiston Mamale, I don't believe that he was angry about that money and earn respect to make vocals. I remember him being very happy to be in Europe for the first time and Koffi presenting him to his staffmemebers as his son. Don't forget that Babia Ndonga, Eric Tutsi, Mogodo, Suzuki, Willy Bula were big names when he joined and Koffi was then only taking 4 singers to Europe. So it was then very hard to make it. Babia Ndonga, Eric Tutsi and Sam Tshintu all the same thing. They didn't sing direcly on albums when they joined and didn't really care about the money. So all those concerts of Koffi Olomide, Papa Wemba and JB Mpiana were "concert ya promotion" ? Now I understand why they didn't put their names on the wall of the concerthall. Back in the days Emeneya was saying the same thing, but I thought that he was jealous about them performing there before hi, but he was right. Damn I'm discovering that all those things he was saying were true, first about those fake gold records and now about those concerts at Olympia. My friend was also saying that but he was a 100% Zaiko and Wemba-fan, so I tought that he saying that because of jealousy. 3 years ago I read an article about that show of Koffi at Olympia and they were saying that same thing. 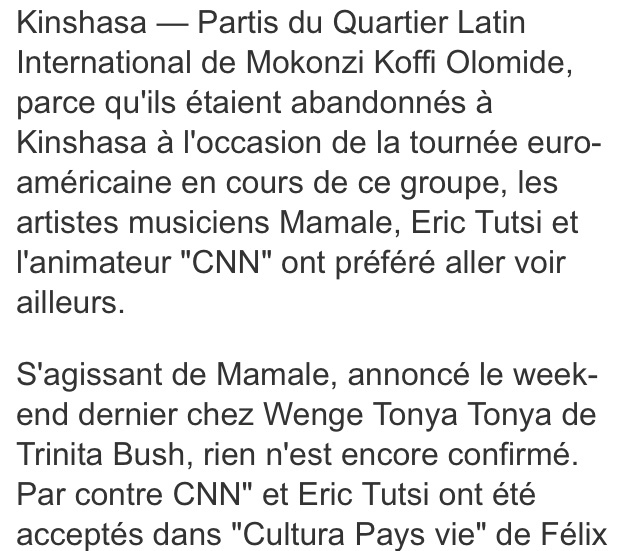 Also about that of his concert at Zenith de Paris, saying that kompa-singer Tabou Combo performed before him. Constant Lomata who's now the governor of Tshopo used to booked double events at Olympia & Zenith. So will that say that those concerts of Koffi at Zenith & Olympia weren't official ? And those who performed at Zenith later (JB Mpiana, Emeneya, Papa Wemba, Werrason & Zaiko) also ? My cousin just said that he was Papa Wemba who asked Koffi Olomide to let Mamale stay behind in Kinshasa because of not being happy that he started a relationship with Tabou Fatou. But were those musicians and bandleaders taking those relations with Tabou serious hahahaha ? I've been told in this forum Mamale joined them in Europe in 2001 after Zenith and USA. He even participated to the first recording-session of Effrakata but he left after Koffi stole one of his girlfriends. So when Brigade and Kerozene came CNN,Eric Tutsi,Babia ect were still there it seems like Koffi didn't really liked them anymore he didn't even show them in the VHS where they rehearse for Zenith. Yeah, maybe he forgot. one or two concerts, then he went to BCBG. There was moment that he wanted to join Cultura Pays-Vie with CNN & Eric Tutsi before going to Europe, but people in Cultura weren't liking him and Wazekwa was doubting about accepting them in the band. CNN was suspended, he had only to perform with them in concerts, but was forbidden to rehearse with them. Babia became strange, he was addicted to drugs and he was barely singing in concerts. Fans weren't also taking him serious anymore and started to pay more attention to Paparazzi. Because after Bercy he said that he left Quartier Latin which was then for the second time and then he rejoined them quickly when Quartier Latin returned to Kinshasa. But about Eric Tutsi I don't understand it, because himself he said back in 2014 or 2013 that he left Quartier Latin because of Koffi being angry at him, for threaten Chamberton. Since that Chamberton started to sing his songs in his presence to humilate him. Just for asking to Koffi if he could give him money to repair his car. Because those shegues saboted his car after performing at Cinemax. Back in those days Koffi was in war with the shegues of Matonge, for running one of their friends over which made them furious. With them promising that they would attack him and his musicians everywhere. I don't know how he reconciled with them, but it were tense days. I think that 'Face ya Farata' and 'Petit Guelord' were one of those guys.